The newly sequenced genomes of two marine worms shed light on the 570 million-year evolution of gills into the human ability to bite, chew, swallow and speak. 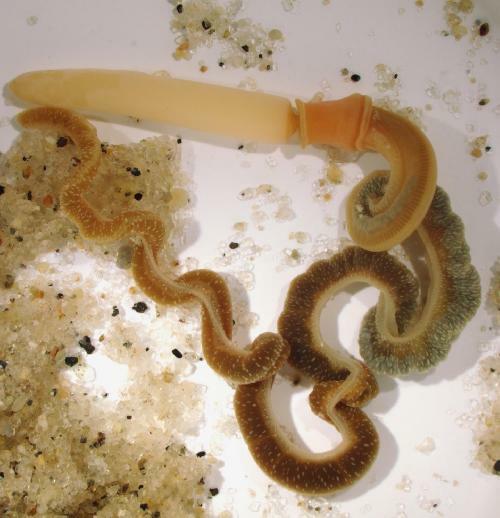 The draft genome sequences (doi:10.1038/nature16150) of two species of acorn worm, which live in U-shaped burrows in shallow, brackish water, are the first genomes of hemichordates, which retain similarities to the first animals to evolve pharyngeal or "gill" slits. Those ancestors eventually gave rise to chordates: animals with backbones and hollow nerve cords, like humans and other vertebrates. Since acorn worms and the human lineage diverged 570 million years ago, pharyngeal slits for filtering food evolved into gills for extracting oxygen, and later into today's human upper and lower jaw and pharynx, which encompasses the thyroid gland, tongue, larynx (voice box) and various glands and muscles between the mouth and the throat. Humans and other terrestrial vertebrates actually initiate vestigial gills while embryos, though they disappear quickly and rarely persist in infants. "The presence of these slits in acorn worms and vertebrates tells us that our last common ancestor also had them, and was likely a filter feeder like acorn worms today," said Daniel Rokhsar, one of the leaders of the sequencing effort and a UC Berkeley professor of molecular and cell biology and of physics. "Acorn worms are marine invertebrates that, despite their decidedly non-vertebrate form, are nevertheless among our closest invertebrate relatives." "It's an ugly beast," acknowledged John Gerhart, senior author of the report and a professor of the graduate school at UC Berkeley. "Acorn worms look very different from chordates, which makes it especially surprising that they and chordates, like humans, are so similar on the genomic, developmental and cell biological levels." In fact, about 70 percent of human genes have counterparts in the acorn worms, suggesting that these are ancient genes inherited from the common ancestor. One of the peculiarities of the acorn worm is its dozens of pharyngeal slits, which allow it to filter seawater pumped through them to capture nutrients, algae and bacterial prey. These slits evolved into the gill slits of fish and other marine vertebrates, which became specialized to extract oxygen from water and, in the process, lost their ancient filter feeding role. The unique finger-like 'head' or proboscis of the acorn worm is used to probe the sand for mostly single-celled algae and bacteria, which it then re-suspends in the water to be sucked in and filtered through the gill slits. "What's so great about having gill slits is the large volumes of water you can put through the animal to collect food; they allow high-throughput filtering and feeding, whereas other animals take one gulp, deal with the food in that one gulp, expel the water out the mouth and take another gulp," he said. "The pharyngeal area of these worms and of all deuterostomes is their most significant shared innovation." Deuterostomes, which arose in the pre-Cambrian era, comprise chordates, acorn worms - the most ancient deuterostome - and a close relative, the echinoderms, which include starfish and sea urchins. Deuterostomes and another group, the protostomes - 25 phyla encompassing the insects, mollusks and annelids like earthworms - include all bilaterally symmetric animals. While scientists at Baylor assembled an initial draft sequence of the Saccoglossus genome, Rokhsar teamed up with the Okinawa group to improve the genome sequence and also sequence the whole genome of a tropical Pacific species, Ptychodera flava. The two are distant cousins, separated by 370 million years of evolution. By comparing the new genome sequences with sequences of many other animals, the team found that clusters of genes on the same chromosome in humans are often found clustered together on the acorn worm genome. Sometimes even the local structure of the cluster is the same, despite the fact that the two genomes diverged more than half a billion years ago, Rokhsar said. A particularly interesting cluster is a group of six ordered genes that are all implicated in the development of the pharynx and gill slits in both acorn worms and vertebrates. Pharyngeal gill slits - found at least primitively in all deuterostomes - are thought to be an evolutionary innovation that defines the group as a whole, he said. "We think this is an ancient deuterostome-specific cluster of genes that is involved in patterning the pharynx," Rokhsar said. Another surprise was that deuterostomes have more than 30 genes that have no counterpart in non-deuterostomes but are similar to genes found in marine algae and bacteria. Several of these genes are involved in modifying the sugars that coat our cells. Either these are very ancient genes that all other animals lost, or they were acquired by "horizontal transfer" from algae and bacteria very early in deuterostome evolution. While bacteria are well known to exchange genes in this manner, it is rare and somewhat controversial to find bacterial-to-animal transfers, Rokhsar said.